​After a pause Ukraine again is in the headlines of European media. The main newsbreak of the week was the scandal in the government. “Ukraine is threaten with a new political crisis after the resignation of the minister responsible for the reforms. This caused a pressure on the hryvnia. On Monday, the price of government bonds began to drop”- writes the influential Dutch financial newspaperFinanciele Dagblad about the last statements of Minister Aivaras Abromavicius. The author notes that in an interview the minister said, that only the government of technocrats able to continue the process of reforming the country which needs more transparency. The newspaper writes that the president is responsible for reforms in the country: “Fabulously wealthy businessman who two years ago was elected as successor to the corrupt ex-communist Viktor Yanukovych. Poroshenko has promised reforms and fight on corruption. But so as often happens in the former Soviet republics after a while the reformers turn out to be corrupted themselves”- the newspaper writes. In these frames gets force referendum, campaign in the Netherlands. The influential Dutch edition of NRC Handelsblad published a thorough analysis of the “for” and “against” the Association Agreement with Ukraine. Among the arguments “for” publication cites: improving trade, particularly good for Dutch exporters stimulate reforms in Ukraine, “voting against – means voting for Putin,” the Association Agreement means more stability at the external borders of the EU, and therefore for the Netherlands, the agreement improve the human rights situation in Ukraine. The producer of the channel told about the success of the film, and to promised to repeat its airing. But leading French media criticized him mercilessly. “Speaking of that” war is everywhere, “that” ultra-rights impose their demands “(…) an attempt of disinformation which is not original, because the film reflects elements of the language of the Kremlin, and its heralds like Sputnik” – writes Le Monde. Also, most of the news media informed that the former IMF chief Dominique Strauss-Kahn joined the board of directors of Ukrainian Credit Dnepr Bank, owned by Ukrainian oligarch Victor Pinchuk. In the Dutch press is growing campaign on an association agreement with Ukraine. The arguments “for” and “against” are more and more sound in the media. “For us, the question is obvious. The choice in favor of deeper European Association will encourage the transition of Ukraine, will help to increase equality and reduce backstage policy will lead to greater legal certainty and reduce dependence on the whims of influential oligarchs – it will increase competition and reduce bureaucracy “- the authors write. As economists they operate with the facts. “It is good for economic growth, job creation and the fight against poverty in Ukraine. The Association Agreement also provides more chances for European, and therefore the Dutch investors and exporters in Ukraine, as a market of 45 million consumers. The economy begins slowly to improve. The IMF expects that in the coming years the growth will return to the level of 4 percent, “- say the authors. They claim that support Ukraine means to support the aspirations of the people for a better life and a better economy. At the same time gets force and negative information about Ukraine. So, the media actively discussed the MH17 tragedy. According to the new director of the European airspace control “Eurocontrol” Joe Sultana Ukraine has not informed in the time when the accident happened, that it cut off the radar system of control for technical reasons. This was not reported to the relevant services. Belgian newspaper De Morgen cites the relatives of the victims. “Skansman Thomas, father of 18-year-old Quinn, who was on the plane said that current statements of Ukraine are even more incredible:” Ukraine cannot explain why it did not have radar in times of war, when the aircrafts are being shot down in the sky. It is impossible to believe in the fact that in Ukraine had no radars then”- writes De Morgen. However, the Brussels online media outletPolitico ​writes that during the active campaign “for” that lasts only a few days, the number of those who would vote for an association agreement with Ukraine increased. ” Dutch voters are opposed to the Netherlands’ ratification of the European Union’s association agreement with Ukraine, but the gap between Yes and No is getting smaller. According to a poll published in De Volkskrant Monday, 44 percent intend to vote in favor of the agreement, and 55 percent would vote No. In a poll in December 2015, the figures were 38 percent Yes and 62 percent No. The Yes campaign was formally launched Monday” – reports the media outlet. ​The main new on Ukraine of the last week was the preparation for the referendum an association agreement in the Netherlands. Dutch press pays to this issue more and more attention, more and more and more politicians and experts are arguing about this. The government allocated subsidies for those who want to campaign “for” and “against” association. So soon the campaign will reach its peak. At the same time the question of involvement of the Dutch people into the process – is still open. 30 percent of voters or 4 millions of the Netherlanders have to come to vote in order referendum to be conducted. Other Dutch online media outlet Follow the money decided to launch a special project on the occasion of the referendum, where the consequences will be analyzed. The publication notes that in this issue emotions are dominating, but for the Netherlanders it is difficult to make a choice as there is shortage of facts. “This is a big question whether the Hague and Brussels will implement the referendum’s decision if the people say “no”. Referendum is not obligatory, it is running from the January 1. However, this expression of public opinion is important. Dutch people can speak out on important political issues “- says the author. The Belgian press, which pays much less attention to referendum, disseminated the statement of the president of Petro Poroshenko about launching lawsuits against Russia in connection with the annexation of the Crimea. The publication notes that Kyiv wants to return the Crimea via sanctions and international pressure. “The Russian economy has suffered from falling oil prices and Western sanctions in connection with the Ukrainian crisis. The fall in GDP in 2015 was 3, 7% after an increase of 0, 6% in 2014 according to the official statistical data released on Monday, 25 January. As says the President Putin and the ministry of economy, this recession will last and probably in 2016, the year “- the newspaper writes. The main news of last week on Ukraine was a pure provocation: the video pretending to show the soldiers of a volunteer battalion “Azov”. There they warned Netherlands: if you vote against the association agreement, you have no place in our land. The people in the promotion video threatened to appeal to their brothers from the Islamic state, and to take a revenge, in case of a negative vote of the Dutch people. Ends the video with the theatrical burning of the Dutch flag. Despite the blatant provocation, the news has been disseminated in the number of the Dutch media outlets and on television. The author cites the Ukrainian expert Andrei Boytsun, who says that the provocateurs who producedthe film could be encouraged by Russia. The newspaper also wrote that the Ukrainian Foreign Ministry warned the media about the expected high- scale of provocations against Ukraine on the eve of the referendum. The propaganda war over the referendum on Ukraine reached a new height – reports the respectful NRC Handelsblsd. “According to the adviser of minister Avakov Anton Gerashchenko and member of the Ukrainian parliament, Ukrainian experts could prove that this video is made in Russia. “Putin is doing everything possible to get a negative result of the referendum” – said Gerashchenko”. News also ignored one of the most influential Dutch newspaper De Volkskrant. Nevertheless, opponents of the Association Agreement with Ukraine, including its initiative GeenStijl, actively used it in their campaign. Belgian and French newspapers mostly ignored the news. ​The main newsbreak of the last week on Ukraine is a new trade war with Russia. “Ukraine suspends free trade with Russia. So, Kiev responded to the previously done demarche of Moscow “, – writes the Belgian newspaper De Standaart. Most European media wrote about the embargo that Ukraine imposed against Russian goods, in response to the demarche of Moscow. It came into force on January 10 and will last at least until August this year. “The recent controversy regarding the import and export started after Ukraine signed an agreement with the European Union. The Russian authorities have reacted to the trade preferences received by Ukraine. In Russia they are confident that the closing of borders is inevitable, as the country must protect its own agriculture and industry, “- writes the Belgian media outlet De Morgen. The author also recalls Ukraine’s debt to Russia taking roots from the time of Yanukovych. “Ukraine this week said it would suspend payment of the Russian debt, as Moscow refuses to make concessions on the issue of debt relief. According to the business newspaper Financial Times Russia is going to take legal steps to get back 3 billion euro, “- says the publication. The Dutch press is actively discussing the preparations for the referendum on the association agreement with Ukraine. On April 6, the Dutch people have to vote “for” or “against” the Association Agreement with Ukraine. The initiative initiated by the Euroskeptic political force GeenPijl. And although the results will not be binding, the government will have to take them into account. Thus, in one of the leading newspapers NRC Handelsblad an interview with European Commission President Jean-Claude Juncker was published, where he warns that this situation could result into a “continental crisis”. “According to Juncker this will play into the hands of populists who want to undermine the EU. “Let’s not allow this referendum to turn into a referendum on Europe. I sincerely hope that the Netherlands will not say “no” for reasons that have nothing to do with the association agreement “, – says he. Most publications have also written about the first victims of the armed conflict in the east of Ukraine. Thus, the Belgian edition of De De Redactie reports that a new year has brought the first death of the Ukrainian solders. ​The last week was marked by a number of provocative materials on Ukraine in the media. The scandal was provoked by the information that the allegedly Ukrainian volunteers are painting stolen from a museum in Westfries in Hoorn (The Nethrelands). The European press, which mainly characterized by prudence, blindly disseminated the information from the press conference of the director of Museum Ad Herdink. Without any evidences, he said that 24 paintings are in the hands of the activist of the Ukrainian volunteer battalion. And he supposedly requires 5 mln. euros for them. At the same time the in some way it is backed by the leader of Ukrainian party “Svoboda” Oleg Tyagnibok and ex-chief of Ukrainian secret service Valentin Nalevaychenko. This press conference was also attended by the mayor, who said that because the Ukrainian militaries are threatening to sell the paintings to someone else they want publicity, to prevent this. This theme was picked up by most Dutch media. At the central TV channel NPO in a primetime were showed alarming picture of Ukrainian nationalists who allegedly have paintings. This information was disseminated in the frames of the referendum on the Association Agreement, which is to be held in the Netherlands on April 6th. Thus, invited experts mostly said that Ukraine – anarchic country where the president has no authority over the army. The other “negative” about Ukraine in the press concerned the cutoff of the electricity supply to the Crimea, as a result of the incident the power lines were damaged two weeks ago. The press put the blame for this on the Ukrainian nationalists. Currently, so-called “Crimean authorities’ stated that in the Yalta zoo died a tiger cub of Tygriulia which was given to the zoo by Yulia Tymoshenko. This was due to the lack of electricity, and therefore heating. “The death of the white tiger – is the fault of Ukraine” – under such a headline reported the new Belgian De Morgen. It reports about the meeting of Peter Poroshenko with the US Vice President Joe Biden in Kiev. “In the new battles with pro-Russian separatists, which burst out despite the agreements,were killed eight Ukrainian soldiers – say in the army. Moscow should cooperate with Kyiv to hold local elections in the Donetsk and Lugansk regions controlled by separatists, said Biden. Russia is in the Minsk Group negotiators on the conflict in eastern Ukraine, but does not admit to be a party in the conflict “- the newspaper writes. There is also positive on Ukraine. The media reported on the meeting in Brussels of Ukraine-European Council which took place on Monday. ” Ukraine ‘3%’ away from EU visa-free green light ” – the EUObserver writes referring to positive report on Ukraine’s progress. However, the main problem is still the fight on corruption. “The EU has warned Ukraine it needs to finalise anti-corruption reforms to get a thumbs up for visa-free travel by the end of the year ” – the media outlet writes. The problem of battle against the Islamic state and the terrorist threat, which became the primar concern of Europe, plays into the hands of Russia. The publications in the European media of the last week confirm this. It is broadly covered the visit of the French President Francois Hollande in Moscow on November 26. This is the first time as a European leader visited Russia since the annexation of the Crimea and the sanctions – writes the European press. The French leader visited Russia in order to agree on cooperation in combating ISIS. “Putin was in the elevated mood first of all because he finally received a visit from the head of a European state – the first time after the EU due to the annexation of the Crimea and the beginning of the war in eastern Ukraine imposed tough economic sanctions. Hollande’s visit plays on the internal image of Putin. It works on his political objectives – to show that he is still a major player in the international arena. But whether it is going to succeed, after its invasion to Ukraine and Syria, it is the big question. So French President risks of accusations that he allowed to play with himself. Even if this criticism is unfair “- writes the Belgian newspaper De Morgen article “Hollande brings together opposites”. The publication shows a pictures of Hollande’s other visits payed during the weekhow he welcomed with the other leaders – Merkel, Obama, Cameron and Putin. Even on the photo one can see that with the last he keeps a distance. Another stumbling block – is the fate of Syrian President Bashar Assad. US and EU insist that he should leave his post Russia says that “it is up to Syrians to decide”. 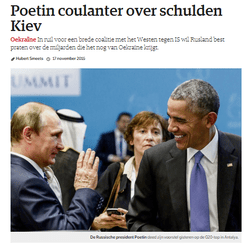 The Brussels online media-outlet EU Observer came up with the author column “Think twice before teaming up with Putin in Syria”. The author writes that on the one hand the West needs the help of Russia; on the other – it is clear that Moscow will ask its price. “Inevitably, the sanctions issue, implementation of Minsk II and the status of Crimea will be brought to the table. Because of Western insistence on the illegality of the annexation of Crimea, it is unlikely that a compromise can be found there. What is more, a possible climbdown from principle on the part of Western countries could only invite Putin to try the same tactic in other circumstances. The most that could be achieved is Russian reaffirmation to support the Minsk II process in exchange for a gradual reduction of sanctions that do not affect the Crimea issue. At the same time, Western countries could give more space to Russian demands in relation to the Syria peace negotiations, including a transitional role for President Assad – something which is being openly discussed these days in any event”- writes the author. The publication notes that for now Ukraine have sufficient coal reserves, at least six weeks it can provide electricity without any shortcomings. At the same time, Russia is currently working on the construction of power lines, which should ensure the electricity in Crimea for 40 percent of its need. The newspaper also notes that on this background the fighting intensified in eastern Ukraine. Dutch press in its turn actively wrote about the visit of Ukrainian President Peter Poroshenko, in the Netherlands, held on 26 November. Predictably, the main topic was the referendum on the association agreement with Ukraine, which should take place in the Netherlands on April 6th. In the Netherlands Poroshenko was meeting with politicians, this was widely covered by local media. Interview of President appeared on the biggest channel NOS. However, the Dutch Prime Minister Mark Rutte said that the association agreement – doesn’t mean membership for Ukraine. The opponents of Ukrainian integration often play on this thesis. In his turn, President Poroshenko noted that they are playing into the hands of Putin – this quote was widely distributed in the Dutch media. ​The terrorist threat in Europe has moved the issue of Ukraine to the background, but some Europeans understand this and try to prevent. The main news last week, which was written by the media were around the cutoff of the electricity for Crimea. ” About 1, 8 mln. People were left without electricity in the Crimean Peninsula, which was annexed by Russia in the beginning of the last year. Authorities declared a state of emergency “- the media writes. And then goes to Russian media quoting: «Russia Today writes that radical groups” Right Sector “tried to stop trying to fix the system”. Another top topic in the media of Benelux countries was a common “voyage” of foreign ministers of the Netherlands, Belgium and Luxembourg to Ukraine. Not surprisingly, they talked about the referendum in the Netherlands on an association agreement with Ukraine. Due to the initiative of GeenPeil on April 6 Dutch people should say they are “for” or “against” the agreement. Parliament has ratified it, so the results of the referendum will be advisory in nature. The publication quoted the Foreign Minister of Ukraine Pavlo Klimkin, who says he respects the right of Netherlanders speak about the referendum. “I am absolutely confident that the Dutch people understand what is at stake in this referendum, in particular the European values ​​we share” – said the Minister of Foreign Affairs “- the newspaper writes. The publication also quoted Minister of Foreign Affairs of the Netherlands Bert Koenders, who says that the association agreement would not mean Ukrainian membership in the EU. Thus the EU only wants to support the economy of Kyiv, and therefore – to promote the necessary reforms. “At a time when the world is busy with attacks in Paris and the war with ISIS, it is important not to forget the situation in Ukraine” – said Koenders. In eastern Ukraine are still fighting between the Ukrainian army and the pro-Russian separatists despite Minsk agreements that should ensure the ceasefire “- the newspaper writes. However, the author noted that some aspects of visit were frustrating. “In addition to the other venues, ministers have visited the Cathedral of St. Michael where the wounde people were treated during the Revolution. “Two years after the revolution, killing over a hundred people, yet no one convicted” – told Tetyana Mazur human rights activist to the delegation. Minister Didier Reynders said later that during the day he had not received responses about the investigation of these facts “- the newspaper writes. And notes, that the Minister has met with the President of Ukraine Petro Poroshenko, Prime Minister Arseniy Yatsenyuk and other officials. Foreign Minister promised to monitor how the investigation develops. However, delegates assured that they will put pressure not only on Ukraine with the demands of reform, but also on Russia. “If there is no real progress, we’ll extend sanctions” – quoted the journalist the Minister. Also, most European media wrote about the attack on the director of the Institute of Forensic Expertise of the Ministry of Justice Alexander Ruvin. Press stated that he is involved in the investigation of the MH17 tragedy. There is good economic news as well. “Ukraine is no longer in a state of default” – wrote the French newspaper Le Figaro, referring to the rating agency Fitch, which has raised the rating of Ukraine from RD (restricted default) to CCC (possible default). But the main positive of the last week for Ukraine was the success of our national team and its getting into the Euro 2016. This new was reported by an absolute majority of the sport departments. “Ukraine got its ticket to the Euro” “Ukraine is also in the Euro” – such were the headlines on this issue. The main news on Ukraine last week in the European media predictably were focused on the second, decisive round of local elections. Though these news were overshadowed by the terrorist attacks in France. Most attention was payed to the winners in Kyiv, Dnipropetrovsk and Lviv. “44-year-old Klitschko, head of the party” Solidarity “(…) gained from 65 to 71 percent of the voters. His opponent, Borislav Bereza from the ultra-right the “Right Sector” gained 30 percent – writes the Belgian online media outlet De Redactie – Klitschko, who cannot boast with much achievements, besides media speeches, owes his victory mainly to the infirmities of the opponent”. The newspaper also notes that in Lviv predictably won Andriy Sadovy, and in Ivano-Frankivsk Ruslan Martynkiv from the party “Svoboda”, “which was accused of Nazi ideas”. “Fighting in the large eastern city Dnipropetrovsk promised to be fierce. But candidate of oligarch in exile Igor Kolomoisky Boris Filatov received a convincing victory “- the newspaper writes. Press actively wrote about meeting of the G20 leaders, held during the weekend in Antalya. Among others it was attended by Russian President Vladimir Putin and US President Barack Obama. Despite the fact that the main theme of the meeting was the fight on terrorism, the participants also talked about Ukraine – report international agencies. In the frames of this meeting, the press spread the news that Russia is ready to make concessions on the issue of Ukrainian debt. “Moscow no longer requires that Ukraine pays until the end of the year $ 3 billion debt. But he (Putin) wants Ukrainian debt to be granted by US and EU “- reports the Dutch NRC Handelsblad in the article “Putin makes Kyiv concessions on the issue of debt”. The newspaper notes that the restructuring proposed by Putin, stipulates that Ukraine will not pay three billion just before the end of the year, but will pay one billion per year during three years. “Russia is ready to give Ukraine more time to repay their debts. The government in Moscow believes that it is a time for a broad coalition with the West against the Islamic state. To end the isolation of Russia, which is currently prevents to cooperation, the Kremlin is ready to make concessions to Ukraine “- the newspaper writes. Brussels media outlet Politico in the article “Attacks in France put NATO on the spot” writes that recent events require more decisive action from the Alliance. It goes, in particular, about the use of the fifth article of NATO when all members collectively respond to the attack on one of its members. However, for a strong response, NATO requires cooperation with Russia, which conducts an active military campaign in Syria – the newspaper writes and cites expert Ivo Daalder, who was US representative to NATO: “Some would worry that too much cooperation with Russia would be at the expense of Ukraine”. Another topic was the controversial amendment to the Labour Code, which must guarantee equal rights for sexual minorities in Ukraine. From the second attempt parliament has approved this provision. However, many members percept it as “trade-off” – writes the Brussels media outlet EUObserver in the article “Ukraine gives equal rights to gay workers, to please Brussels”. “The European Union had set the inclusion of anti-discriminatory provision for lesbian, gay, bisexual, transgender, and intersex (LGTBI) people as a prerequisite for visa-free travel by Ukrainians to those European countries which are part of the Schengen area.” – the newspaper writes. And notes that this decision was also as a measure required to move closer to the EU out fear of Russia. “It’s better to have a gay parade on [Kiev’s main street] Khreshchatyk than Russian tanks in the centre of the Ukrainian capital,” – quotes the journalist an MP Yuriy Lutsenko a member of president Petro Poroshenko’s party. Meanwhile in the Netherlands, the campaign is gaining momentum on the Association Agreement in Ukraine. Recall April 6 Dutch have a referendum to determine whether they are “for” or “against” cooperation with Ukraine. Although the decision has no binding character, the government will respond to it. The government has allocated € 2 million subsidy that should stimulate debate on this issue. ​European media actively wrote last week about the European aspirations of Ukraine. In particular, in the focus was the refusal of the parliament to accept the laws that had to provide Ukrainian visa-free regime. The media outlet writes that this decision caused a wave of criticism from European human rights activists. And recalls that European Commission President Jean-Claude Juncker had promised to recommend to provide Ukraine visa-free regime if it fulfills the EU conditions. “The anti-corruption efforts have also stalled. EU diplomats and leading NGOs, such as Transparency International, are saying that Ukraine’s prosecution service, for instance, operates like an organised crime syndicate. Meanwhile, Thursday’s vote shows that Ukrainian society is closer to Russia in terms of social mores than to western Europe. Both countries decriminalised homosexuality shortly after the fall of the Soviet Union”- the newspaper writes. The main theme in the Netherlands about Ukraine became a referendum on the association agreement which is to be held on 6 April. There are active debates in the society around the issue. However, several experts emphasize that the forces that oppose European integration for Ukraine – in the Netherlands this is GeenPeil EU BurgersCommittee – often manipulate the facts. The expert said that there is lack of objectivity regarding the agreement with Ukraine. “The government should clearly explain that this agreement in our national interest and why ‘no’ will harm them. The reasons? Dutch producers, such as farmers, will benefit from this trade agreement. These are the companies most affected by the trade boycott. Moreover, the Netherlands for the past years are in the top five investors in Ukraine. And “no” will harm the European economy “- says the expert. The publication writes about a special team of experts East Stratcom Team, which tracks the false information, triggered by the Russian Federation in the information space. “According to the EU – this is a wide spread problem, the written on the site of the EU Delegation to Ukraine. So-called “Disinformation Review” is published weekly and is compiled by the European task force”- the newspaper writes. And gives Russia’s response, which considered this initiative to be “contrary to freedom of thought”. “Russia Today also reacted to the EU plan. “The EU is trying to eliminate the possibility for alternative opinions in the foreign media” – said the chief editor Margarita Simonyan “- writes the newspaper. Another news was the decision of Vladimir Putin to attend the climate conference in Paris, on November 30. The fact that he confirmed his participation was announced by French Foreign Minister Laurent Fabius. The meeting will be held at the highest level, beyond Putin the US President Barack Obama is expected as well. Therefore, journalists suspect that not only the climate will be discussed there. “After the launch of the Russian military air campaign in Syria, Putin again plays a prominent role on the international stage. Therefore, it is likely that the conflict in Syria may be on the agenda as part of climate negotiations, as well as the crisis in Ukraine “- writes the Belgian newspaper De Morgen. The main new of the week on Ukraine in the European media was announcing of the referendum in the Netherlands on an association agreement with the EU. Despite attempts to challenge the referendum in the courts – it is still assigned. However, notes that some people in the Netherlands say that it will be too late in April – as this date will not facilitate voter turnout. “Liberal Party D66 MP Kees Verhuven warns that April 6 will already be too late. “From January 1, 2016 will come into force economic part of the Association Agreement. This may give the impression that the vote is meaningless “- says the journalist. Great publicity gained searches in the Library of Ukrainian Literature in Moscow. The Russian police broke into the library because they say it allegedly distributing extremist literature and conduct anti-Russian propaganda. After interrogation the police arrested library director Natalia Sharina. “Police searches in Ukrainian library in Moscow covered mysticism” – writes the Belgian newspaper of De Trouw. “Director Sharina currently in custody on suspicion of inciting ethnic hatred, her home ransacked Russian investigators. However, it is not clear whether there is sufficient reason to keep her in custody. This case – looks as politically motivated – said some Russian lawyers. Because such offenses are usually punishable by a fine “- is written in the publication. The French press is actively wrote about the visit to Russia of former French President Nicolas Sarkozy on 29 October, which was and remains one of the biggest supporters of President Putin in Europe. Sarkozy, who has a good chance in the next presidential elections in France in 2017, opposes EU sanctions against Russia. He recalled about this position once again. Surprisingly, recent events in Dnipropetrovsk with the detention of UKROP politics until now received not much publicity in the European press. The main news of the last week were predictably focused around local elections in Ukraine held on Sunday. “On Sunday Ukrainians went to the polls for the regional elections, which should be the next step in the formation of democracy after the Revolution on the Independence Square. They were an important test for President Peter Poroshenko – who is not so popular any more – and have become a test for the administrative capacity of the country”- writes the Belgian newspaper De Standaart in the article “Ukrainian elections probably will be in chaos (but can change a lot)”. Another Belgian edition De Morgen published an overview of a number of elections held on Sunday, not only in Ukraine but also in Poland, where the parliament was elected and Argentina (elected president). In the block on Poland and Argentina’s edition focused on the winners, but on Ukraine highlighted – that the process was chaotic. “In Mariupol port city of half a million people in the East after the debate on the election ballot, the polls were not opened – the newspaper writes – they were printed on typography of oligarch Rinat Akhmetov ally of pro-Russian President Viktor Yanukovych, who fled at the beginning of 2014-th. To prevent fraud bulletins will be printed on a neutral typography “. However, the main news about Ukrainian elections, which was distributed by the majority of the media was the story of Chewbacca. The Star Wars hero was arrested for illegal campaigning on the Election Day in Odessa. “The Star Wars character Chewbacca on Sunday put on handcuffs in the Ukrainian port city of Odessa. Hairy beast was not arrested for war crimes during the war between the rebels and the imperialists, but for the usual election campaign for his new master Darth Vader. A man in a suit stood for election candidates Darth Vader, who according to his passport really has this name”- writes the Belgian newspaper Het Laatste nieuws and adds video from Youtube. These examples do not play on the benefit of Ukraine on Dutch television appeared several news items where it was represented as a country where anarchy reigns. This is particularly important in the context of a referendum initiated by BurgerCommittee proposes to abolish the ratification of the Association Agreement with Ukraine. In time of continuing lawsuits in Dutch courts on the feasibility of a referendum, an active debate on this issue goes on in the Dutch community. Despite the active criticism of Ukraine there are great supporters as well. For example, one of the largest newspapers De Volkskrant published author column of respected politician Bart van Vincent in which he urges the international community not to leave Ukraine. Another Dutch newspaper NRC Handelsblad came up with an analytical article on the change of information policy of Putin, and shift – from Ukraine to Syria. “Russian viewer no longer sees Ukraine. Syria has become a battlefield, where Putin wants to create beautiful scenery “- writes the journalist. The journalist cites analysts who say that Syria was an opportunity for Putin to get out of isolation. “Putin thus says Buyonov found a way out of political isolation in which he sat after the war in Ukraine. This is particularly important for the domestic front. Russia comes just as the United States, Russian news show every day. “No more pictures of ruins and civilian victims in Eastern Ukraine at Donbass” – says Buyonov. Publication lists several possible tasks of Putin in Syria – to keep the influence in the Middle East, to get out of isolation and to withdraw the Ukrainian question in the background. The press also highlighted the diplomatic row between Ukraine and Oxford University, which published false information about the belonging of Crimea. “There was a diplomatic row between Ukraine and respected university Oxford. The reason is the publication of a new textbook for secondary schools of reputable publisher Oxford University Press. It called Crimea no longer the part of Ukraine. This cannot be – say in Kiev. Russia seized the Crimea last year by military means, but by law Crimea has always been the part of Ukraine (….) Oxford University Press announced that stopped the sale of the atlas, but can not return already sold copies “- writes De Standaart in the article “Ukraine is angry on Oxford University”. Some newspapers noted the new leg to the conflict between Ukraine and Russia – the closure of direct flights between the countries. The most important news break on Ukraine last week was the presentation of MH-17 tragedy investigation results by the Dutch safety board (OVV) which took place on 13 October . Though for some of the journalists it was disappointing as the experts haven’t answered the most important question: who is guilty? For now it is considered to be proved that the plane was downed with the BUK-rocket launched from the territory controlled by separatists. At the same time some stones were thrown in Ukraine, as according to the experts, it hasn’t taken the situation seriously enough and didn’t close the sky space below conflict regions. This topic was actively discussed on TV channels and in press, where appeared a lot of critics against Ukrainian authorities. “Ukraine had to close the airspace from precaution, says the Investigation Board (OVV) today presenting its conclusions on the crash of flight MH17. The device according to the OVV was shot down by a Russian-made BUK missile. Russia asserts that the missile was fired from Ukrainian territory” – reports the Dutch “De Volkskrant” in a live blog on the developments under the headline: “The rocket came from the pro-Russian area” . The media outlet quotes the OVV speaker Tjibbe Joustra: “Everybody thought it was safe, even though they knew that an armed conflict was in progress. No one took into account the possibility that a civilian plane at an altitude of 10 kilometers can be in danger”. Ukraine insists that there were no obvious reasons to close airspace – reports the newspaper and quates Joustra, “But we have concluded that there was sufficient reason”. The newpaper also reports that Russia disagree with the conclusions of the commission calling them biased. The other version is given as well, it is presented by the Russian BUK rocket producer company Antey, whose experts presuming that the fatal rocket was Ukrainian one. Though the media outlet is critical to this info calling it Russian attempts to define informational flows. This new was broadly echoed in other countries. “Flight MH-17 had never to fly over Ukraine” – reports Belgian popular newspaper “Het Laatste news”. In the article the journalist asks several questions. “Does it mean that Russia stays behind the tragedy?” – asks journalist and responses that allegedly the rocket was launched from the area controlled by the pro-Russian separatists. But who has done this still to be established by the investigation. Another question puts shadow at Ukraine: “Why Ukraine gets part of the accusations”. For this he notes that “Ukraine haven’t closed the airspace” and “everybody thought it was safe to fly”. At the same time Russia gets more and more the image of occupant in the eyes of Europeans. “Flanders International Film Festival Ghent tonight brings a sneak preview of the Norwegian series The Occupied, a controversial political thriller (based on an idea Jo Nesbø) in which Russia makes a velvet occupation of Norway” – reports Belgian newspaper De Morgen. Russian embassy already protested against film considering it to be in the “worth traditions of Cold War”. But the series is already broadcasted on Norwegian TV for a couple of weeks. French “Le Monde” came up with the headline on the front page “Why Putin began war in Syria?”. The newspaper writes that Russia has created a coalition in the East with Syria, Iraq and Iran to fight against ISIS, but also as a counterweight to USA, as now the political leaders of Iranian shiits begin thinking about alliance with Russia instead of USA. Also Iraq more and more tending to cooperate with Russia – reports the newspaper. “The military participation of Russians in Iraq is still limited, but Washington notices the increasing coordination between Baghdad and Moscow. At the begin of September the Americans have faced the ignorance of the Iraq on their demand to close airspace for Russian planes transporting troops and weapons. In the end of September Iraqis authorities have announced the launch of coordination center of joint security between Iraq, Iran, Russia and Syria for informational exchange and coordination of attacks in Syria” – reports the newspaper.